City hopes move will pave the way for team to move to San Jose. Lew Wolff (L) owner and managing partner of the Oakland Athletics speaks at a press conference with Major League Baseball Commissioner Bud Selig. 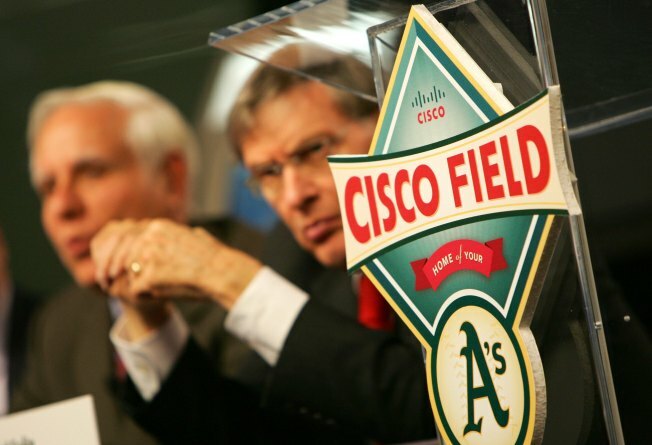 Bud Selig may not be so quick to give his college buddy a deal but the city of San Jose has no such problem. San Jose is finally ready to sell about five acres of prime downtown real estate to the Oakland Athletics for what both the team and the city hope will eventually turn into a new baseball stadium. The problem is, Major League Baseball is yet to rule on removing San Jose from the San Francisco Giants' territorial rights. On top of that some observers are surprised at the selling price of the land. San Jose is selling the property for $6.9 million, about a quarter of what the city originally paid for it and about $7 million less than what the land would be worth on the market, according to The San Jose Mercury News. "I think the price is a fair price when you consider that we want a ballpark, and the A's will have to pay for the ballpark with their money," San Jose Mayor Chuck Reed told the paper. "And let's not forget that if we get a ballpark on the land, we get money and 1,000 jobs or so." The sale would give the A's exclusive rights on the condition that the team build a stadium on the land. San Jose has spent the past several years buying up the land and moving local businesses off of part of the six parcels. The cost of all that work was about $25.1 million. The San Jose City Council is expected to vote on the sale of the land at its Nov. 8 meeting.